The HP Photosmart Plus B210A Printer uses our replacement high yield HP 564XL ink cartridges, and is an ideal printer for home, school, and casual business use. The HP B210A has a lot of features making your print jobs easy. Its touchscreen allows for convenient commands, its dual paper trays allow for large print jobs without having to constantly keep loading more paper, and it has wireless connection features with WPS setup. The print quality is phenomenal, and when you use our 1ink.com replacement HP 564XL ink cartridges your documents and homework assignments will beam with clear, sharp text and images. 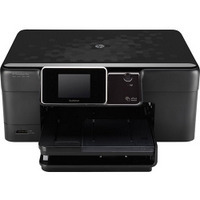 Do you need ink for HP B210A printers to print your family photos? Be sure you use our HP 564XL package deal to truly capture the details of your images, as the pigment in this cartridge is designed for maximum results on glossy photo paper. The downsides of the HP B210A printer is that it doesn’t allow duplex print, there is no USB socket, and you need to by an adapter for xD cards. If you need HP B210A printer ink, try our replacement 5 Pack of 564XL ink cartridges and save more than 60 percent off the OEM price!